Welcome to Fish Window Cleaning! We provide commercial window cleaning services to businesses of all sizes in Rockford, Loves Park, Machesney Park, Cherry Valley, Belvidere, Roscoe, and Rockton, IL! We provide free on-site estimates! Call us today at (815) 904-7045. We’ve cleaned millions of windows in the past 30 years, and if there’s one thing we’ve learned, it’s this: Sparkling windows are not only a reflection on your business; they’re a reflection on ours. That’s why we are committed to your satisfaction. Our exceptional quality and service are unmatched. We are a national franchise company made up of locally owned and operated businesses which means you will receive the personal touch. From our custom cleaning programs to detailed invoicing, we’ve made window cleaning hassle free. Regardless of your budget, we can put together a program that meets your needs. In addition to our high quality service, we are licensed, bonded, and insured. For FISH, there is no job too big or too small. Our uniformed professionals can handle everything from a local flower shop to a college campus. Whether we are visiting you twice a week or twice a year, you can rely on us to show up. We’ve led the industry with a premiere safety program to ensure the protection of our customers and cleaners. We also provide the peace of mind that licensed, bonded, and insured window cleaners will be maintaining the appearance of your business. Let FISH brighten your world at work and at home too. Call today to have one of our experts give you a free on-site estimate. Our national accounts department is your single point of contact to work with you locally, regionally, or nationally. With one e-mail we can reach out to our FISH locations throughout the country to provide coverage information, as well as gather pricing for our services. For more information, please contact Paul Collum at (877) 707-3474 x 232 or paul@fishwindowcleaning.com. 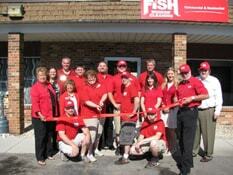 Fish Window Cleaning locations are independently owned and operated. 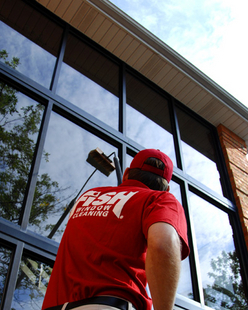 The core services include commercial and residential window cleaning. Additional services may be offered by some but not all franchised locations. Additional services are at the discretion of the franchise owner.